Confession time: I seriously screwed up this level for myself. First I played it two or three times, as is my habit for these things, fully intending to write up a level review shortly. Then I moved into my new apartment and got sidetracked. Then I played the level again, thinking I would THEN review it, only to get buried in work for a few weeks. So as I played it again just now, for what must have been the fourth or fifth time, I realized I had managed to make one of the great Tomb Raider levels of all time appear boring via repetition. Now, if I can emerge from my self-inflicted, Scion-Sanctuary-Repetition-Malaise, I should be able to remember what a truly brilliant level this is. While we’d seen massive environments before in the game, somehow, the giant sphinx that serves as the major set piece for this level manages to break our expectations, once again. I remember staring at the screen as a kid, in awe, as I slowly realized what I had Lara standing on. Even in an imaginary world where anything was possible, it didn’t seem possible. I don’t know if I can quite get across why I like the concept of the sheer vastness of something being the enemy, rather than anything outright malignant; I think it mirrors the fact that the real enemy in these games is always vast abstractions. Sure, panthers like to jump at Lara from time to time (and don’t get me started on Atlantis, although I guess at the rate I’m going, I’ll have to soon enough), but the actual combat is a sideshow, usually. Our eternal antagonist: space, the epic distance between where our heroine is and where she needs to be. And time, what Lara herself only has so much of. Times like this, I wish I’d already played all the Tomb Raider games to completion- while I completed TR1-3, I only played a few levels each of TRLR and Chronicles, and none of the Gold levels- because I’d like to be able to say that this is the best use of the design choice, within the series, of putting the exit right near the entrance, but making you take a wallop of a trip to actually get there. I can’t know for sure, but I would bet money that it is. Some find this idea stupid: why create the level in such a way that if Lara would only think to take an axe to the bars on the left of the entry hall, she could bypass all the level’s attractions and get through it in five minutes? However, there’s more to it than that; doesn’t it pretty much exemplify the idea of the journey being more important than the destination? After all, going meta again, you could just use a level skip cheat and solve all of Lara’s problems relatively easily, but who does that? In a lesser level, having the endpoint be thirty feet from where you start would be legitimately annoying. However, considering that this section of the game redefines what we thought the word “grand” meant, it works. Besides, I like to think that even if Lara did have an axe on her and tried to go the quick route, the tomb wouldn’t allow it- one of those metal slamming-door traps would fall on her head or something. The people who built this tomb would not take kindly to their craftsmanship being ignored. Fighting with the mummy guys in this area is so fun, it almost makes me forget how terrifying they are...nah, not really. Even though it’s obvious that Tomb Raider isn’t really about combat for me, it’s worth noting that the combat in this area is pretty intense. 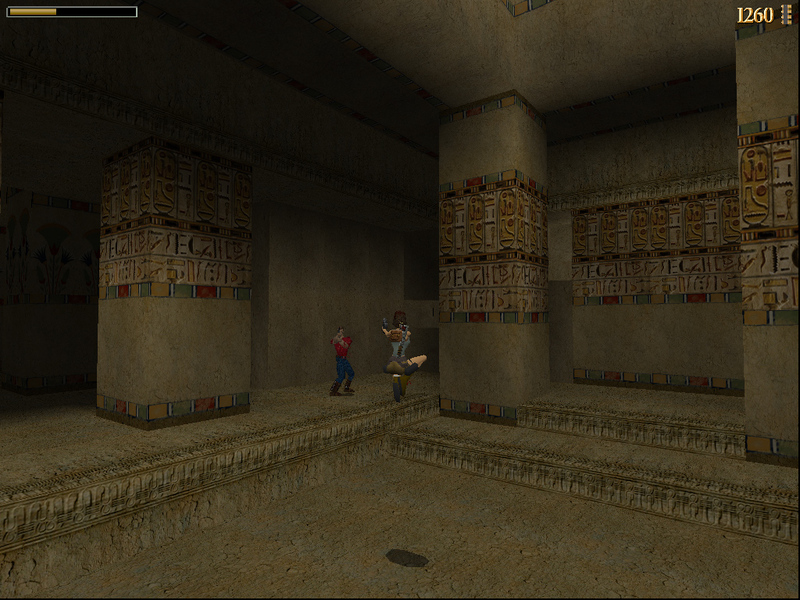 I find I sometimes have to do the opening encounter over to keep from wasting medipacks- sometimes you can kill the psycho-mummies with no damage, but sometimes they go after Lara like they’re hungry and she just took a bath in bacon grease. What’s really nice though is that good save crystal placement keeps most of the combat in this area from ever getting too frustrating. Sure, the winged Atalanteans love to push Lara off high platforms to her death, something hard to avoid with the limited room to maneuver that you have, however, if you haven’t just saved ten seconds beforehand, it’s kind of your fault, honestly. The only encounter that I find rough is the one that occurs right after you get the scarab- that’s an all bathed-in-bacon-grease, all the time affair- but it doesn’t bother me when I get the opportunity to save right before the challenging part. Now in TR2 and TR3 you can save wherever you want, but with that freedom comes greater potential to screw yourself- as I often do, especially in TR3. Let’s just say this level makes me appreciate the simplicity of the “save only at the designated save crystals” system; I honestly think it’s the best system overall when implemented properly. I’m going to break with 99% of Tomb Raider fandom here and admit that I do not like this level’s sole secret. While it suits this level for there to be only one secret, but it’s a doozy- it fits with the whole feeling of grandeur this level has going on- invisible platforms are, in my opinion, unfair. It seems like the kind of thing that everyone looked up online/in a guide and never would have found for themselves. The kicker is, I had never gotten this secret before this playthrough, but I knew there was an invisible platform somewhere- so as I was playing, I was actually looking for one and I still couldn’t find it. I had to eventually go to Stella’s site and look at some screenshots to figure out where the hell that sucker was. Yeah, I’ll level with you- there really are no Stupid Larson tricks. The mechanics of his running around don’t seem to be nearly as complex as those of Pierre, which I guess is understandable since he doesn’t have to pull any disappearing acts. Also, usually by this point in the level I don’t have the patience to spend a while trying to lure him into doing something cute. Hey, if you think I’m missing something, feel free to discover your own Stupid Larson Tricks and send them in, although I wouldn’t necessarily recommend it. It’s hard to pick between the moment you realize you’re on top of a giant Sphinx, and the first time you get a good look at the two massive underwater statues- both are very memorable moments. 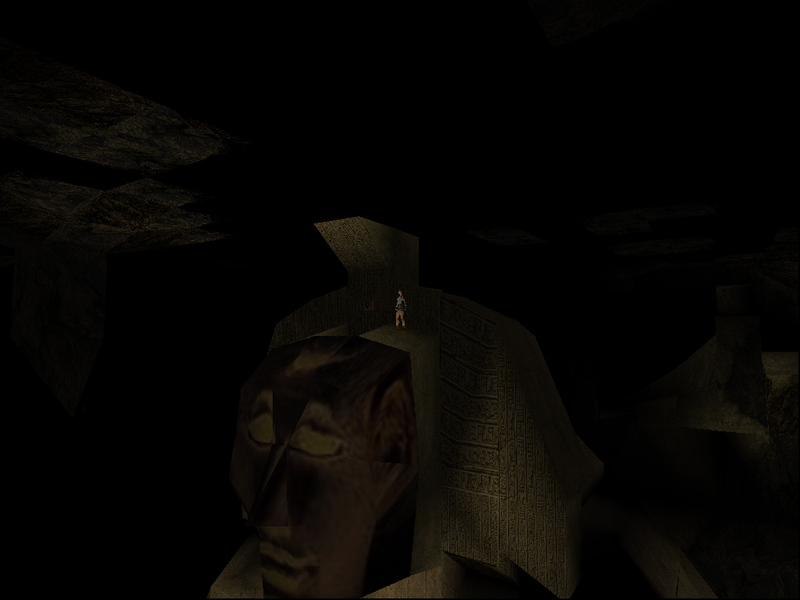 I’m going to go with the Sphinx though, just because I have to pick one and it’s the dominant imagery from this level. To be more specific, the exact moment when the camera pans out and you realize you’re standing on the Sphinx’s head is the crowning moment. The fact that that darn switch between the statue’s legs is so hard to see- I swam around for like twenty minutes and didn’t see it, then checked a walkthrough and then felt silly when I realized I’d probably swam right past it several times. I really hate stuff like that, because it can bring your progress to a complete halt for no good reason- it’s one thing if I’m stuck on a puzzle and I need to spend some time thinking about it, quite another if I’m right in front of the solution and I can’t even see it. Someone who didn’t like Tomb Raider games once told me that they hate the “running around for an hour, looking for a switch that’s the same color as the wall,” gameplay and in this instance, I have to agree with them. Also, I always screw up that jump to the platform suspended above the pool on the way to get one of the Ankhs, but I realize full well that’s probably entirely my fault- I’m just mentioning it because it’s a minor annoyance. The triple-whammy of the incredible Spinx room, the massive underwater statues, and the great combat make this one an unquestionable five out of five to me- even with the irritating switch problem. This level just oozes classic Tomb Raider goodness; it’s one for the ages. Next: Natla’s Mines, where I’d like to know what they’re actually mining, and the introduction of the “I have a job!” factor- you’ll see. Previous PostX-Men Episode #7: Couch-MenNext PostX-Men Episode 8: It’s the G-Virus! You know, this review has made me like Sanctuary of the Scion a little more. I always disliked the huge rock-climbing sequences throughout – they got kinda monotonous for me, but your review has reminded me that the grandness of the actual sphinx and the underwater statues, and how they truly amazed me when I first saw them. About the underwater switch – I couldn’t find it either! It’s SO hard to see it! I always thought that I was the only with this problem, so it’s nice to see a fellow player that had this issue, too. That issue with the switch bugs me so much I almost knocked the rating down to 4/5, but eventually decided that this level brought so much general greatness to the table that it deserved a five. It’s a pain though, because a 5/5 really should be a perfect level, and this one has a pretty unforgivable flaw IMO. I guess, in the age where anyone who gets stuck can look up the answer in an online walkthrough, it’s not as important as it was back in the day, meaning the overall inventiveness of the level should win out over petty pixel-hunting concerns. 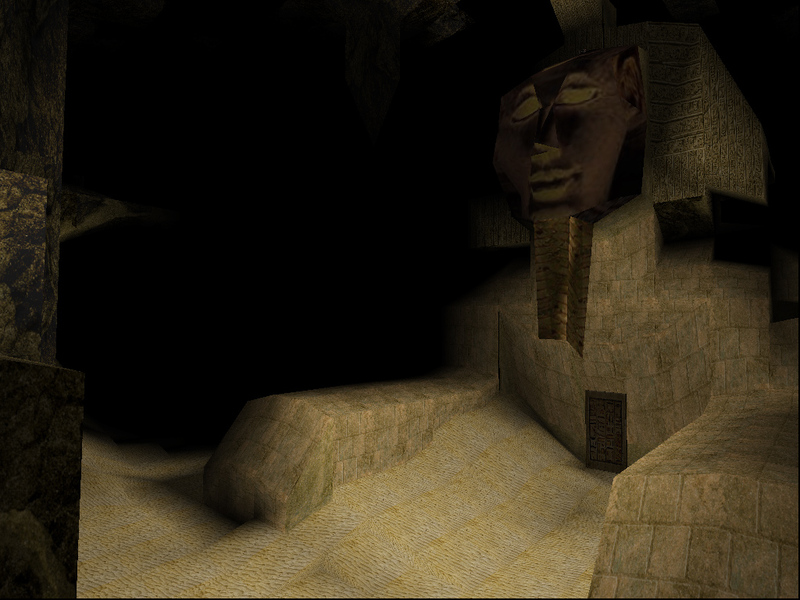 It rankles the purist in me though, because in a well-designed TR level you really shouldn’t have to look anything up. I don’t want people to find it “in google,” I’m a rebel that way!